It is 1958 and France's first nuclear submarine, Plongeur, leaves port for the first of its sea trials. On board, gathered together for the first time, one of the navy's most experienced captains and a tiny skeleton crew of sailors, engineers and scientists. The Plongeur makes her first dive and goes down, and down and down... Out of control, the submarine plummets to a depth where the pressure will crush her hull, killing everyone on board, and beyond. The pressure builds, the hull protests, the crew prepare for death, the boat reaches the bottom of the sea and finds... nothing. The Plongeur was a first for France: "an experimental vessel," verily, "powered by a new design of atomic pile, and boasting a number of innovative design features. Its very existence was a national top secret. Accordingly, its melancholy fate went entirely unreported." (p.2) Or it did till today, half a century since its mysterious disappearance. 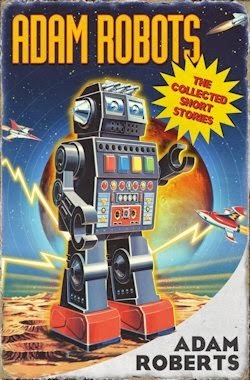 Now, though, its story can be told. And who better than Adam Roberts to do the reporting? West of the continental shelf, the skeleton crew of the Plongeur—the plunger, if you must—set about stress testing what was then a particularly progressive vessel. In the process, its engineers expect to identify some small problems; instead, the submarine simply sinks. Something has obviously gone catastrophically wrong, and as the Plongeur is drawn inexorably towards the ocean floor, a collision with which is apt to collapse it—though by that depth the immense water pressure will have long since spirited away the several souls aboard—its crew of courageous countrymen prepare themselves for the inevitable: the end. Unbelievably, this is but the beginning of the Plongeur's story: the end is set in what seems to be a different dimension, and it's years ahead yet. 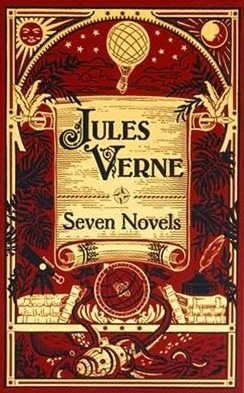 "Could it be that we have somehow slipped out of reality altogether, and into the imagination of Monsieur Jules Verne?" The lieutenant was, of course, joking; but Jhutti, peering at the glowing end of his cigarette, appeared to be taking the idea seriously. It is not. Roberts keeps us guessing, however, till the fantastic last act of his latest. Twenty Trillion Leagues Under the Sea is part pastiche, part ambitious science fiction: a hardy hybridisation which inherits some of the best elements from both the author's normal novels as well as his semi-regular send-ups, such as the recent sequel of sorts to The Soddit. For starters, this is a book with a brilliantly British sense of humour. Expecting to be dead in the water, as it were, the crew share certain desperate confessions. You can imagine how awkward the situation is when the "inevitable catastrophic extinction" (p.31) they have prepared for simply evaporates into mystery. Meanwhile everyone smokes all the time, treating fire and flames like so much mood lighting in a highly combustible environment. Despite said silliness, Roberts treats the greater tale with almost complete seriousness, documenting the Plongeur's extraordinary voyage rather than making fun of its more farcical aspects. Thus "the childranha" (p.201) are a source of genuine terror, and when one submariner lands on a giant hand, I too "felt a flash of panic," (p.212) if not on behalf of the character concerned. In point of fact that's exactly what Twenty Trillion Leagues Under the Sea lacks. "Its captain was no-one; its crew nameless." 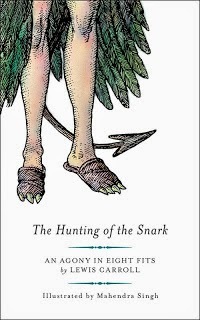 (p.2) Those characters that there are, most of whom come and go over the course of the story, are introduced in a rushed roll call that left this reader reeling, whilst the closest thing to a protagonist we have is the observer Alain Lebret. Determined as he is "to manipulate the mood of the group," (p.102) however, he's horrid from the offing, and if anything less sympathetic by the end. I'm afraid I tried and failed to find a single sailor to care about. As indeed do we. Luckily, Twenty Trillion Leagues Under the Sea is immediately appealing, and though the endless fathoms flag for a chapter or five, Roberts picks up the pace in time to pave the way for a satisfying if madcap finale, made all the more memorable by Mahendra Singh's marvellous full page pen-and-ink illustrations. 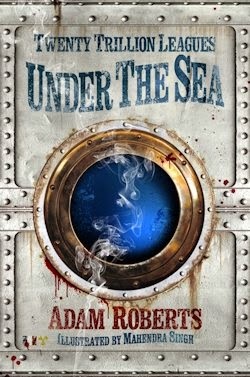 As ever with Adam Roberts' writing, the science is meticulous, and the fiction articulate. Twenty Trillion Leagues Under the Sea may have more in the manner of smarts than heart, but I for one very much enjoyed the voyage.